Our Happiness starts with us, with our conviction, with our hope and with our Happiness PowerPrayer. We can choose happiness in life. But it takes energy to do this! How much are we going to put into making our vision a reality? The Positive Psychologists talk about something called Activation Energy - the "start up" energy that is required get something started. Establishing our solid practice requires "Activation Energy" and once this is established we are, as I say, "on a roll". It will affect all areas of our lives. I remember when I was concentrating on this activation energy. I knew that the more energy I put into my practice, the less energy I needed to use in my daily life...the more smoothly everything in my life went. Somehow everything took less time, and I was always in the right place at the right time. The same is true today. 1. Strong Desire - written goals and determinations are really helpful...a fire burning in your heart...HOPE! 2. Connecting with the SGI and making friends in faith. 3. Keeping to a schedule (even if a bit flexible) of chanting twice a day every day. 4. Studying the Gosho and President Ikeda's guidance and sharing this practice with others. 5. Encouraging others to the best of our ability. This is the formula for happiness - and you can do it! WE CAN CHANGE YOUR KARMA. But we have to do it! No one can do it for us. Once we establish the daily rhythm we WILL notice a difference, unless we are eroding our lives by constant complaining and "why me-ing". Turn "Why-me?" into "YES ME!" Remember that no matter what we are facing - We Summoned this storm! Our obstacles are tailor made for us to launch our lives into the next level of happiness. Our obstacles get us there. We can't change our karma without them! Our happiness changes the world. Smiling at another is a cause for our (and their) happiness. According to recent studies, when we smile at a person our smile alone makes a person happier. Our emotions are contagious. And the act of smiling makes us happier too. Isn't that wonderful? and keep some of these phrases in mind while you chant. Use them to fill your life with determination! I am determined to build a life of happiness! and encourage others to chant. I WILL WIN is all aspects of my life! I will win in these areas______________,______________,_________________________, ________________. and have great and fulfilling relationships! I am determined to strengthen my practice, and deepen my faith. I deserve to be happy! 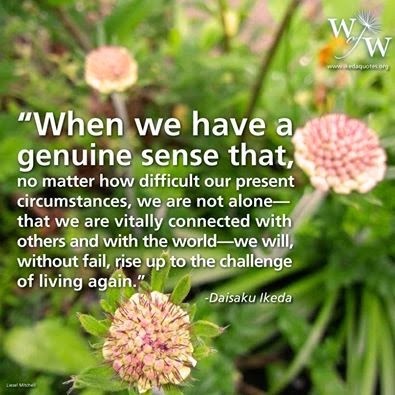 And become a part of our wonderful Soka Gakkai organization to support you. In the SGI you will find friends in faith, be encouraged, and encourage others. Use the SGI-Portal link at the right to find a meeting near you. good affirmation and determination.god bless you.